In this article, I’m preparing a Linux image on a micro SD card. This micro SD card then is used to program the firmware on the i.MX7Dual module using u-boot. I’m using a 64bit Ubuntu, and I will need 32bit libraries later to create the image. So I have to execute the following commands in on my system to get them (see Prerequisites). For multiple reasons, I avoid to format SD cards by the Linux or Windows operating system. 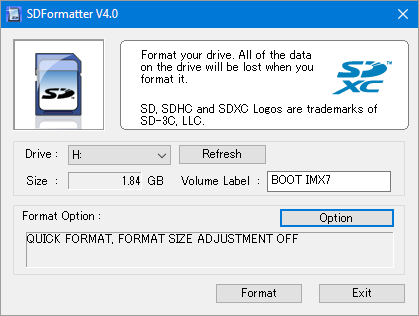 Instead, I’m using the dedicated SDFormatter utility from Panasonic. This ensures that the card is properly formatted and does not contain OS specific files. My DELL Laptop has an internal SD card reader/writer. Because I had issues several times (not sure why?) with cards prepared with that internal card reader, I’m using an external reader. 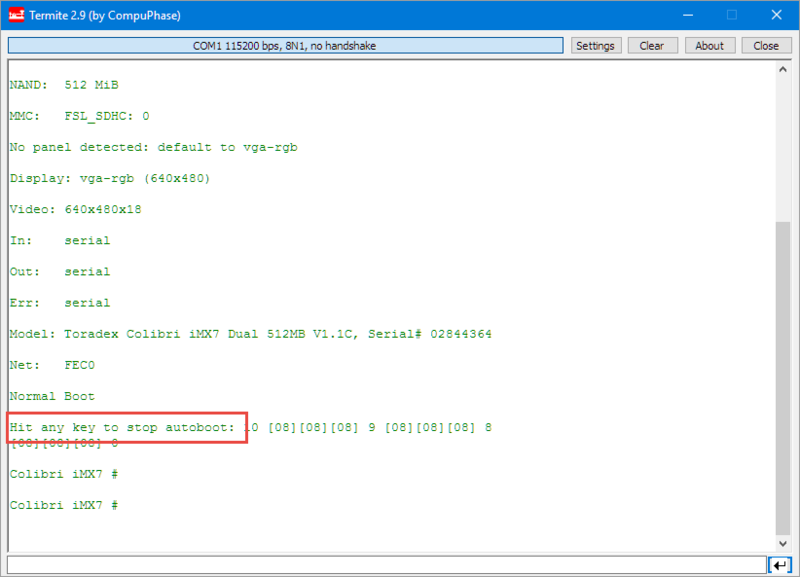 ‘Cd’ into the extracted directory structure. Inside the extracted folder, there is the shell script update.sh. Execute the update.sh script with that CD card mount point found out in previous step, e.g. Successfully copied data to target folder. Optionally, now it would be a good time to create an image file with the Win32DiskImager so I can put that image on an SD card without the need for Linux on the host. The Disk Imager can then be used to write an image to the SD card if needed. 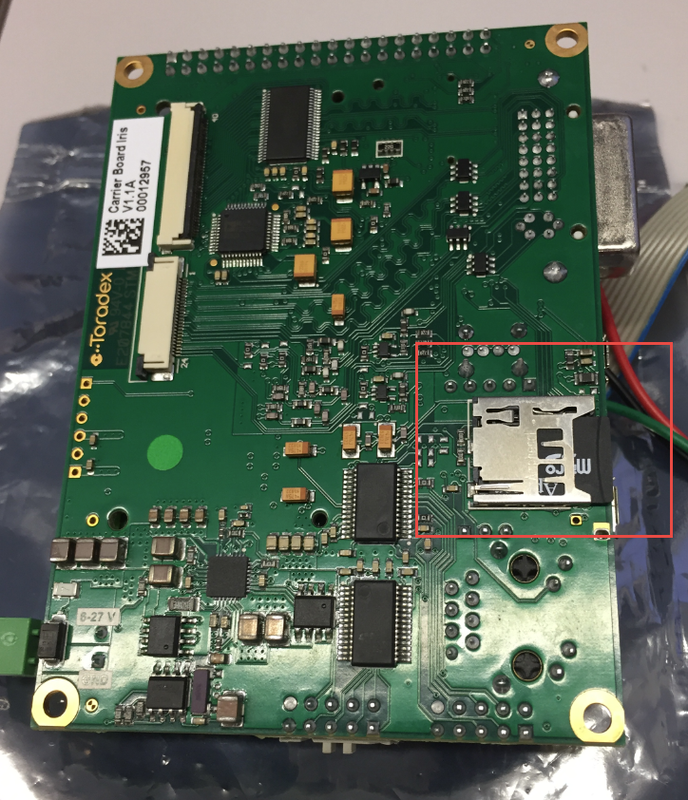 Insert the SD card into the Toradex carrier board and reboot the i.MX7 module. Erasing at 0x80000 -- 3% complete. Erasing at 0xa0000 -- 7% complete. Erasing at 0xc0000 -- 10% complete. Erasing at 0xe0000 -- 14% complete. Erasing at 0x100000 -- 17% complete. Erasing at 0x120000 -- 21% complete. Erasing at 0x140000 -- 25% complete. Erasing at 0x160000 -- 28% complete. Erasing at 0x180000 -- 32% complete. Erasing at 0x1a0000 -- 35% complete. Erasing at 0x1c0000 -- 39% complete. Erasing at 0x1e0000 -- 42% complete. Erasing at 0x200000 -- 46% complete. Erasing at 0x220000 -- 50% complete. Erasing at 0x240000 -- 53% complete. Erasing at 0x260000 -- 57% complete. Erasing at 0x280000 -- 60% complete. Erasing at 0x2a0000 -- 64% complete. Erasing at 0x2c0000 -- 67% complete. Erasing at 0x2e0000 -- 71% complete. Erasing at 0x300000 -- 75% complete. Erasing at 0x320000 -- 78% complete. Erasing at 0x340000 -- 82% complete. Erasing at 0x360000 -- 85% complete. Erasing at 0x380000 -- 89% complete. Erasing at 0x3a0000 -- 92% complete. Erasing at 0x3c0000 -- 96% complete. Erasing at 0x3e0000 -- 100% complete. Erasing at 0x400000 -- 25% complete. Erasing at 0x420000 -- 50% complete. Erasing at 0x440000 -- 75% complete. [ 0.000000] Architected cp15 timer(s) running at 8.00MHz (phys). [ 0.005474] SMP: Total of 2 processors activated (32.00 BogoMIPS). [ 0.005496] CPU: All CPU(s) started in SVC mode. [ 0.103252] DDR type is DDR3! [ 0.110209] hw-breakpoint: found 5 (+1 reserved) breakpoint and 4 watchpoint registers. [ 0.110246] hw-breakpoint: maximum watchpoint size is 8 bytes. [ 0.113681] MU is ready for cross core communication! [ 0.128677] Advanced Linux Sound Architecture Driver Initialized. [ 0.142864] RPC: Registered named UNIX socket transport module. [ 0.142893] RPC: Registered udp transport module. [ 0.142914] RPC: Registered tcp transport module. [ 0.142935] RPC: Registered tcp NFSv4.1 backchannel transport module. [ 0.145058] imx rpmsg driver is registered. [ 0.157020] ntfs: driver 2.1.32 [Flags: R/W]. [ 1.123091] 0x000000000000-0x000000080000 : "mx7-bcb"
[ 1.130656] 0x000000080000-0x000000400000 : "u-boot"
[ 1.137959] 0x000000400000-0x000000480000 : "u-boot-env"
[ 1.145572] 0x000000480000-0x000020000000 : "ubi"
[ 1.153269] gpmi-nand 33002000.gpmi-nand: driver registered. [ 1.944342] Netfilter messages via NETLINK v0.30. [ 1.950595] nfnl_acct: registering with nfnetlink. [ 2.008547] bridge: automatic filtering via arp/ip/ip6tables has been deprecated. Update your scripts to load br_netfilter if you need this. [ 2.464970] VFS: Mounted root (ubifs filesystem) readonly on device 0:13. [ 2.636356] systemd: Detected architecture arm. Welcome to [1B][1;35mThe Ã…ngstrÃ¶m Distribution v2015.12[1B][0m! [ 2.661120] systemd: Set hostname to <colibri-imx7>. [ 2.670413] systemd: Initializing machine ID from random generator. [ 2.678927] systemd: Installed transient /etc/machine-id file. [ 2.983187] systemd: Listening on Journal Socket (/dev/log). [[1B][32m OK [1B][0m] Listening on Journal Socket (/dev/log). [ 3.010406] systemd: Listening on Journal Socket. [[1B][32m OK [1B][0m] Listening on Journal Socket. [ 3.030686] systemd: Listening on udev Kernel Socket. [[1B][32m OK [1B][0m] Listening on udev Kernel Socket. [ 3.077123] systemd: Created slice User and Session Slice. [[1B][32m OK [1B][0m] Created slice User and Session Slice. [ 3.101029] systemd: Set up automount Arbitrary Executable File Formats File System Automount Point. [[1B][32m OK [1B][0m] Set up automount Arbitrary Executab...ats File System Automount Point. [ 3.140924] systemd: Started Forward Password Requests to Wall Directory Watch. [[1B][32m OK [1B][0m] Started Forward Password Requests to Wall Directory Watch. [ 3.170368] systemd: Listening on udev Control Socket. [[1B][32m OK [1B][0m] Listening on udev Control Socket. [ 3.200554] systemd: Listening on networkd rtnetlink socket. [[1B][32m OK [1B][0m] Listening on networkd rtnetlink socket. [ 3.230207] systemd: Reached target Swap. [[1B][32m OK [1B][0m] Reached target Swap. [ 3.250391] systemd: Started Dispatch Password Requests to Console Directory Watch. [[1B][32m OK [1B][0m] Started Dispatch Password Requests to Console Directory Watch. [ 3.280185] systemd: Reached target Paths. [[1B][32m OK [1B][0m] Reached target Paths. [ 3.300501] systemd: Created slice System Slice. [[1B][32m OK [1B][0m] Created slice System Slice. [ 3.347175] systemd: Created slice system-getty.slice. [[1B][32m OK [1B][0m] Created slice system-getty.slice. [ 3.410589] systemd: Created slice system-serial\x2dgetty.slice. [[1B][32m OK [1B][0m] Created slice system-serial\x2dgetty.slice. [ 3.440224] systemd: Reached target Slices. [[1B][32m OK [1B][0m] Reached target Slices. [ 3.601080] systemd: Listening on /dev/initctl Compatibility Named Pipe. [[1B][32m OK [1B][0m] Listening on /dev/initctl Compatibility Named Pipe. [ 3.633665] systemd: Mounted Debug File System. [[1B][32m OK [1B][0m] Mounted Debug File System. [ 3.660324] systemd: Mounted Temporary Directory. [[1B][32m OK [1B][0m] Mounted Temporary Directory. [ 3.692168] systemd: Started Load Kernel Modules. [[1B][32m OK [1B][0m] Started Load Kernel Modules. [ 3.721042] systemd: Started Create list of required static device nodes for the current kernel. [[1B][32m OK [1B][0m] Started Create list of required sta...ce nodes for the current kernel. [ 3.762187] systemd: Started (null). [[1B][32m OK [1B][0m] Started (null). [ 3.791335] systemd: Started File System Check on Root Device. [[1B][32m OK [1B][0m] Started File System Check on Root Device. [ 3.821254] systemd: Started Setup Virtual Console. [[1B][32m OK [1B][0m] Started Setup Virtual Console. [ 3.850796] systemd: Started Journal Service. [[1B][32m OK [1B][0m] Started Journal Service. [[1B][32m OK [1B][0m] Mounted FUSE Control File System. [[1B][32m OK [1B][0m] Mounted Configuration File System. [[1B][32m OK [1B][0m] Started Apply Kernel Variables. [1B][K[[1B][32m OK [1B][0m] Started Remount Root and Kernel File Systems. [[1B][32m OK [1B][0m] Started Create System Users. [[1B][32m OK [1B][0m] Started Create Static Device Nodes in /dev. [[1B][32m OK [1B][0m] Reached target Local File Systems (Pre). [[1B][32m OK [1B][0m] Mounted /var/volatile. [[1B][32m OK [1B][0m] Reached target Local File Systems. [[1B][32m OK [1B][0m] Started Load/Save Random Seed. [[1B][32m OK [1B][0m] Started Rebuild Journal Catalog. [[1B][32m OK [1B][0m] Started Commit a transient machine-id on disk. [[1B][32m OK [1B][0m] Started udev Kernel Device Manager. [[1B][32m OK [1B][0m] Started Flush Journal to Persistent Storage. [[1B][32m OK [1B][0m] Started Create Volatile Files and Directories. [[1B][32m OK [1B][0m] Started Update UTMP about System Boot/Shutdown. [[1B][32m OK [1B][0m] Started Network Time Synchronization. [[1B][32m OK [1B][0m] Reached target System Time Synchronized. [[1B][32m OK [1B][0m] Started Rebuild Dynamic Linker Cache. [[1B][32m OK [1B][0m] Started Opkg first boot configure. [[1B][32m OK [1B][0m] Started Rebuild Hardware Database. [[1B][32m OK [1B][0m] Started Update is Completed. [[1B][32m OK [1B][0m] Created slice system-systemd\x2dbacklight.slice. [[1B][32m OK [1B][0m] Started udev Coldplug all Devices. [[1B][32m OK [1B][0m] Started Load/Save Screen Backlight Brightness of backlight:backlight. [[1B][32m OK [1B][0m] Found device /dev/ttymxc0. [[1B][32m OK [1B][0m] Reached target System Initialization. [[1B][32m OK [1B][0m] Listening on RPCbind Server Activation Socket. [[1B][32m OK [1B][0m] Started Daily Cleanup of Temporary Directories. [[1B][32m OK [1B][0m] Reached target Timers. [[1B][32m OK [1B][0m] Listening on D-Bus System Message Bus Socket. [[1B][32m OK [1B][0m] Listening on Avahi mDNS/DNS-SD Stack Activation Socket. [[1B][32m OK [1B][0m] Reached target Sound Card. [[1B][32m OK [1B][0m] Listening on sshd.socket. [[1B][32m OK [1B][0m] Reached target Sockets. [[1B][32m OK [1B][0m] Reached target Basic System. [[1B][32m OK [1B][0m] Started Timestamping service. [[1B][32m OK [1B][0m] Started D-Bus System Message Bus. [[1B][32m OK [1B][0m] Started Restore Sound Card State. [[1B][32m OK [1B][0m] Started Load default USB gadget schema g1.schema. [[1B][32m OK [1B][0m] Started Avahi mDNS/DNS-SD Stack. [[1B][32m OK [1B][0m] Started Connection service. [ 19.620215] FAT-fs (mmcblk0p1): Volume was not properly unmounted. Some data may be corrupt. Please run fsck. [[1B][32m OK [1B][0m] Started Login Service. [[1B][32m OK [1B][0m] Reached target Remote File Systems (Pre). [[1B][32m OK [1B][0m] Reached target Remote File Systems. [[1B][32m OK [1B][0m] Started Permit User Sessions. [[1B][32m OK [1B][0m] Started WPA supplicant. [[1B][32m OK [1B][0m] Started Network Service. [[1B][32m OK [1B][0m] Reached target Network. [[1B][32m OK [1B][0m] Started LXDE Display Manager. [[1B][32m OK [1B][0m] Started Serial Getty on ttymxc0. [[1B][32m OK [1B][0m] Reached target Login Prompts. [[1B][32m OK [1B][0m] Started Network Name Resolution. [[1B][32m OK [1B][0m] Reached target Multi-User System. [[1B][32m OK [1B][0m] Reached target Graphical Interface. [[1B][32m OK [1B][0m] Started Hostname Service. [[1B][32m OK [1B][0m] Started Update UTMP about System Runlevel Changes. 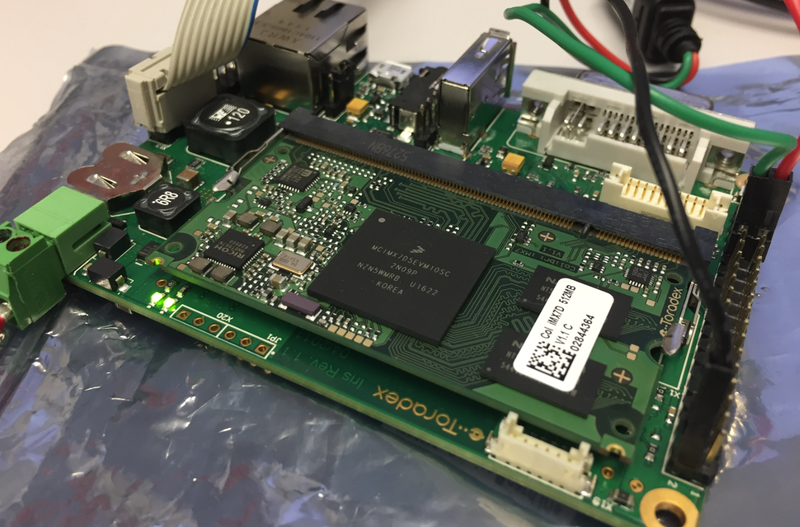 The Linux on the Toradex Colibri i.MX7 module can be reprogrammed using an SD card. The SD card needs to be prepared with the image and then flashed to the module using u-boot. 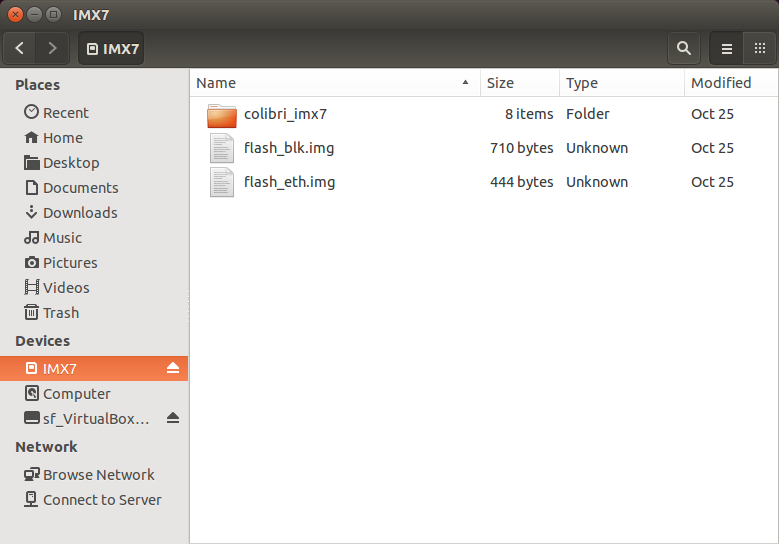 Using the files from Toradex requires a Linux machine to prepare the image. 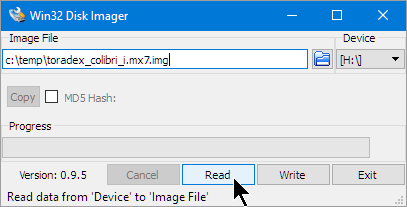 That image can be read by the Win32 Disk Imager Utility, and with such an image no Linux machine would be needed (but still would be useful in any case 😉 ). This entry was posted in ARM, Boards, Building, Colibri, CPU's, i.Mx, NXP, Tips & Tricks, Tutorial and tagged Building, Colibri, Emebedded, Flashing, i.Mx, i.MX7, Linux, NXP, open source projects, software, software project, technology, Tips&Tricks, Toradex, u-boot by Erich Styger. Bookmark the permalink. 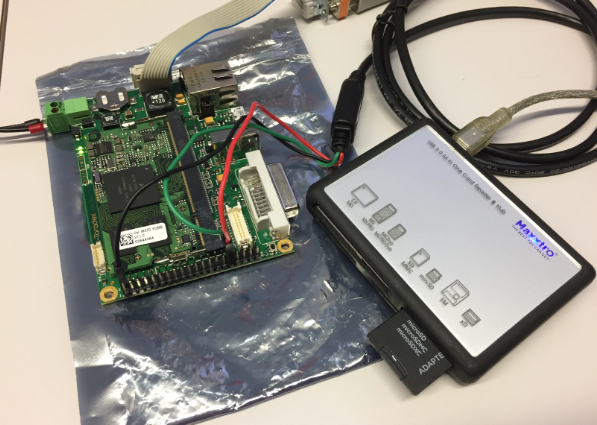 Is the image of the freeRTOS already installed in the NAND Flash (or SD card)? You’ve updated the Linux image and, from the SD card, you’ve removed the contents of the NAND flash memory and written the new image (through the u-boot commands). What has happened with the image of freeRTOS? 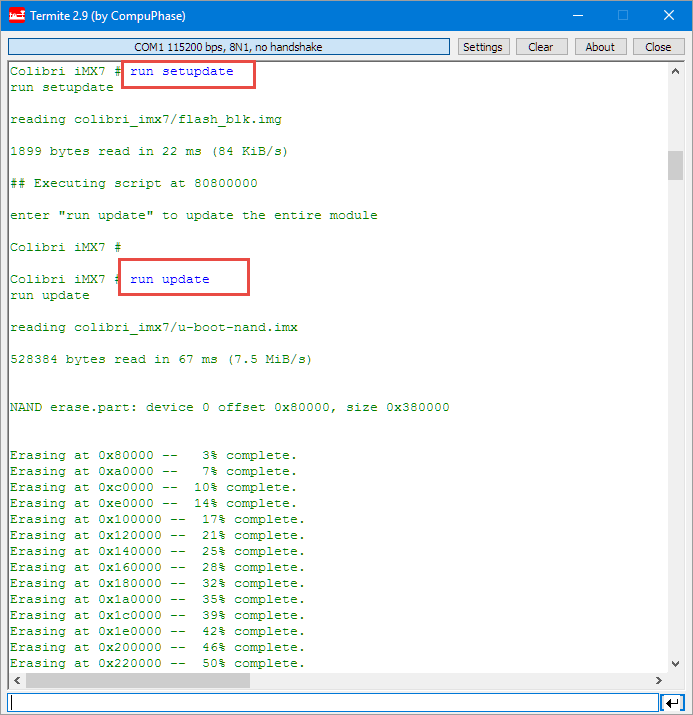 In the previous post you create an application for freeRTOS, but the OS image, is already in the NAND flash and is loaded during boot-time? no, there is no FreeRTOS preinstalled on these boards, and not on the SD card and not in the NAND flash. The default image does not include any M4 parts. This is what I have created with the new image/SD card, and then loaded into the NAND flash using u-boot commands so it is available next time with a reboot. yes, sorry, now I understand. I’ve never used freeRTOS and I was a bit confused. If I’ve understood well, when you compile a freeRTOS application, you are just compiling your application and all the set of sources and headers that provide multitasking to your application, and you end up with one binary file, which is the one you loaded in the previous tutorial. This is independent of Linux OS. Now you can copy again the freeRTOS application and run it from the U-Boot, and sure from Linux OS, but this I don’t know how to do it. yes, I build the FreeRTOS binary with all the necessary drivers, including the application. As things are done on any other embedded system. This is very different from Linux where you have a BSP/Linux kernel and then the application runs on top of it. And it is independent from the Linux aon the Ax core(s): the FreeRTOS runs in parallel on the M4 core. U-Boot is needed because the Ax core comes up first and then kicks off the M4 core. no, I don’t think I have done that in an automated way. Sorry!